The many voices of the British star. Tom Hardy has, over the course of a hugely impressive career, become synonymous with intense, unforgettable performances. His most recent hit, Taboo, arrives on Blu-ray and DVD on May 29th courtesy of Studiocanal and is a brooding, violent and completely absorbing period piece that only serves to increase the general sense of admiration one has when watching him perform. As James Keziah Delaney, Hardy delivers a layered and complex performance as a wronged man out for revenge against a raft of nefarious Regency bounders – so far, so Hardy. Hardy goes regional American in this tale of a booze-soaked crime family. For someone who mostly plays it British, the Yankee drawl is a fresh direction and one that’s impossible not to listen intently to. Regularly voted as one of the best superhero films ever, Christopher Nolan’s final Batman movie stars Hardy as man-mountain and bat-backbreaker Bane. Striking at first, Hardy’s vocals are ultimately what draw you past the muscle, and the effect is powerful. Tackling the dual role of both Ronnie and Reggie Kray, Hardy once again delivers an incredible layered performance – twice! Psychotic and tender in equal measure, both performances, as is often the case with Hardy, rely on far more than mere physicality. In a movie now infamous for its lack of dialogue – particularly from Oscar-winner Leonardo DiCaprio – it may seem unusual to include The Revenant in this list. And yet Hardy’s vocal contributions to Alejandro Gonzalez Inarritu’s masterpiece simply could not be omitted. Adopting the southern drawl once again, Hardy’s voice is simultaneously smooth and cutting, forming a sinister effect as the villain of the piece. A further collaboration with Knight saw Hardy arrive in the critically lauded Peaky Blinders, delivering perhaps his most nuanced vocal performance to date as Jewish gangster Alfie Solomans. 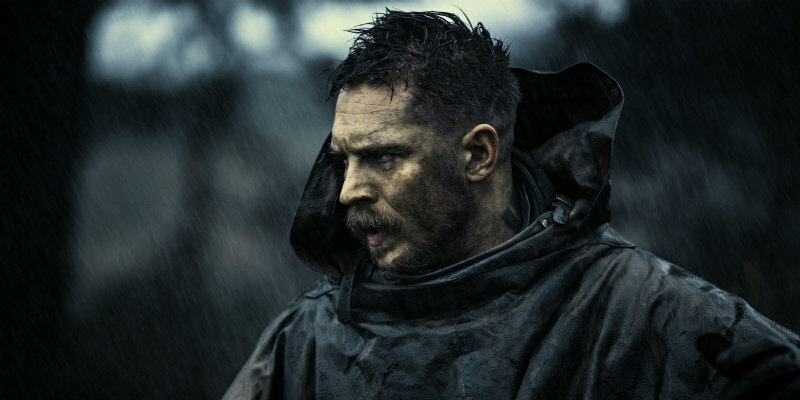 Perhaps Hardy’s finest hour, Taboo is, simply put, a masterpiece of brooding intent. Again, his towering physicality combines with a vocal performance that’s little short of rapturous – so it’s fantastic news that the first season is available shortly and that a second season is on the way. Hurrah!